Additional research provided by John Hairr. For more than four centuries, North Carolinians have benefited from the commercial use of the state's timber resources. As early as the seventeenth century, the Carolina colony's rich forests gave rise to a lucrative naval stores industry that found ready markets as far away as England and the West Indies. Despite profits derived from pitch, tar, and other naval stores, logging soon became the most profitable use of North Carolina's forests. Commercial logging operations and sawmills sprang up during the late seventeenth century. These were mostly local concerns serving construction demands in fairly small localities. By the early eighteenth century, improvements in transportation made sawed lumber an important export. Ships sailing from New England arrived bearing rum, cloth, and other goods and filled their hulls with North Carolina lumber for the return trip. Eventually, North Carolina timber found its way to European and Caribbean markets. Logging supported westward development throughout the antebellum period. Rich timber resources in the Mountain and Piedmont regions made logging and sawmilling a lucrative, though largely localized, business. As railroad lines progressed westward in the years before the Civil War, the market for timber increased. The completion of the Western North Carolina Railroad after the war gave unprecedented access to rich mountain timberland. This opened new markets to North Carolina timber, increasing the potential for profits. At the same time, northern capitalists financed the acquisition of vast tracts of timberland and numerous commercial sawmills, making logging one of the state's most important New South industries. The development of large-scale commercial logging fueled the development of North Carolina's furniture industry, providing a ready supply of quality hardwood for factories in High Point, Hickory, and elsewhere. After 1900, logging also provided raw materials for the state's emerging pulp paper industry. Although the pay was often good, logging was extremely dangerous work. Harvesting trees, particularly on steep mountainsides, required focus, skill, and experience. Sawmill operators often carried the results of a moment's inattention around in the form of lost eyes or amputated limbs. Log flumes, wooden troughs filled with running water, were used to transport logs in steep, mountainous terrain. Flumes were usually used by lumbermen only when other modes of transport were found to be impracticable. Most flumes were built by nailing two boards together at a 90-degree angle, producing a trough that was V-shaped. In North Carolina, flumes are known to have been in operation near Robbinsville, Sylva, and Wilkesboro. The most extensive log flume constructed in North Carolina was built in Wilkes County by the Giant Lumber Company ca. 1907. The flume stretched for 19 miles from the company's extensive timber holdings along the Blue Ridge to the railroad at North Wilkesboro. The structure was destroyed during a flood in 1916 and never rebuilt. Like other extractive industries, logging often came to define a rural community. Logging companies would build a town adjacent to the sawmill, complete with a school, a general store, and worker housing. Despite its dangers, logging often represented the best-paying occupation for uneducated workers in rural areas, and there were seldom labor shortages. By the 1890s the expansion of logging threatened the future of North Carolina's forests. George Vanderbilt, owner of the lavish Biltmore Estate near Asheville, decided to take action. In 1895 Vanderbilt brought German forester Carl Schenck to Biltmore to form the first forestry school in the United States, allowing Schenck to use Biltmore's extensive forests as a laboratory for the latest techniques in scientific forest management. By the 1920s, the state and federal governments began acquiring land for forest management. Loggers and the industries they supported often opposed these state and national forests on the grounds that limits on timber harvesting stymied North Carolina's industrial potential. Proponents of forest management countered that such methods were the only way to guarantee a supply of timber for future uses. More efficient methods of harvesting made this issue more divisive. Logging companies, often because of regulatory oversight, eventually adopted more environmentally sound practices, but the controversies surrounding logging continued. 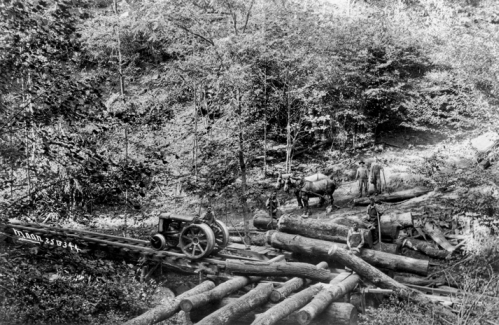 Despite such divisions, logging has had a tremendous influence in North Carolina's social and economic history. Edward L. Ayers, Promise of the New South: Life after Reconstruction (1992). Ronald D. Eller, Miners, Millhands, and Mountaineers: Industrialization of the Appalachian South, 1965-1920 (1979). 1 January 2006 | Hairr, John; Starnes, Richard D.
Ive been a logger for 15 years and my grandfather has told me about when he used to log with a mule and pull the logs out with tractors the rest of the way. I really like a lot about history of forestry in North Carolina.